They reported that a new Obama Middle East Peace Initiative was going to be announced within the next few weeks. Obama's plan was drawn up in coordination with the Arab League and without any input from Israel -- which shocked Israel's Foreign Ministry. 4. Removal of Israel's sovereignty over East Jerusalem, and its transferal to the Palestinians to be the capital of their state. 5. Removal of Israel's sovereignty over the Old City of Jerusalem -- and it will be run by the international community. 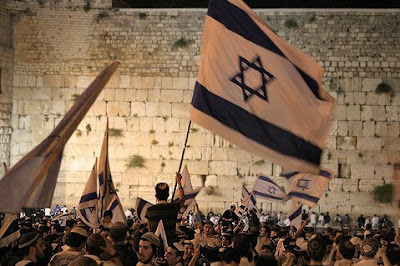 Tomorrow, Thursday is "Yom Yerushalayim", Jerusalem Day -- where Israel celebrates the reunification of Jerusalem in 1967. Any person who advocates the removal of Israel's sovereignty over Jerusalem, and its internationalization is simply, not a Zionist. The Jewish people waited 2000 years to return to Israel and Jerusalem -- we are not leaving again. Not by a Roman Titus, and not by Barak Hussein Obama. Media reports: The new plan is basically an upgrade of the Saudi peace initiative. “IDF Radio" (Galei Zahal) said that international and Arab media sources are reporting developing parts of US President Barack Obama's speech scheduled for early July, in which he will lay out his peace plan for the Middle East. The plan will be based on the two states for two nations formula, and that it will also adopt items from the Arab peace initiative. The reports say that the new plan is basically an upgrade of the Saudi peace initiative, about which both Israel and the US have reservations in its current formulation. Obama's plan will reportedly include the establishment of a demilitarized sovereign Palestinian state with east Jerusalem as its capital. The plan will also call for the Old City of Jerusalem to become an international zone under UN control. Was the story a trial balloon by Obama? Is Ayalon in the dark? Is Ayalon part of the story to "keep things quiet?" Was the story made up as a news scoop? This is appalling. Can we organize protests, marches, March on Washington (for those in the US), action in Congress, etc.? People need to internalize this, publicize this, and understand that Obama's plan first and foremost is about refusing to recognize Israel as a sovereign state, but rather a Banana Republic that can be ordered around by the US. Secondly, and I will post about this soon, the vast majority of the West Bank Palestinian population are now Hamas supporters. The second a "demilitarized" Palestinian State is created, the rockets will start falling on Israel -- the exact same way it happened in Gaza. what does israel get in return? 3. World Condemnation when Israel attacks new Palestinian State. no, really. what does the obama/arab initiative claim that israel gets in return? I'm a reserve soldier in the IDF. Obama must still be smoking crack if he thinks I will participate in our own suicide. Please send enough cookies and juice for me and the other tens of thousand who will sit in jail for refusal. Obama must STILL be smoking crack. Who says he stopped? Tomorrow is Jerusalem DayTomorrow is Jerusalem Day. Tomorrow is the day we commemorate the reunification of Jerusalem. Tomorrow is the day we commemorate when Jews were allowed back into our Holy City and holy sites. Tomorrow is the day that all religions gained freedom of worship in Jerusalem. Tomorrow is the day when Jerusalem was rebuilt again. Tomorrow is the day when Motta Gur said "Jerusalem is in our hands". Tomorrow is the day when the Shofar was blown at the Kotel after years of absence under foreign rulers. Today is the day Obama revealed his plans to rip Jerusalem away from Israel. Today is the day Obama revealed his plans to redivide the city. Today is the day Obama revealed his plans to embed foreign troops into Jerusalem. Today is the day Obama revealed his plans to flood Israel with enemy citizens. Today is the day Obama revealed his plans to appease the Arab enemy with Jewish blood. Are you for today, or are you for tomorrow? Oliver - The truth is that Israel not only will get absolutely nothing in return from the "Palestinians" for any concessions, It can expect greater and more sustained violence against Israeli CIVILIANS - just as it has after signing the Oslo Accords, giving up certain areas in Judea and Samaria (West Bank), removing roadblocks, and above all, uprooting settlers and totally leaving Gaza. "With the two-state solution, in my opinion, Israel will collapse, because if they get out of Jerusalem, what will become of all the talk about the Promised Land and the Chosen People? What will become of all the sacrifices they made – just to be told to leave? They consider Jerusalem to have a spiritual status. The Jews consider Judea and Samaria to be their historic dream. If the Jews leave those places, the Zionist idea will begin to collapse. It will regress of its own accord. Then we will move forward." "The initiative would require the Palestinians to give up their claim of a "right of return," according to Yediot, and Europe and the US would arrange compensation for refugees, including foreign passports for those residing abroad. " Anyhoo, only big concession to me seems making the old city an international zone (like it was originally intended). Arab east jerusalem is already Arab, no loss. I presume har tzofim stays in Israel somehow. 1. What are the odds of the Knesset ratifying such a plan? 2. what are the odds of such a plan being carried out (resident/supporters resistance, soldiers/police refusal)? In any case, this is more of an intellectual exercise - since even this plan will not be accepted by our neighbors. Further - what will be the American reaction to "Israeli intransigence"? Benjamin: While not in the JPost article, it was clearly stated on the Galei Tzahal report. Its also not clear that the Jewish neighborhoods in Jerusalem would not be handed over to the Palestinians...including Ramat Eshkol, Har Choma, Gilo, Ramot, Sanhedriya, etc. LB: We'll have to see how Netanyahu handles it to see if it even gets to the Knesset. It won't be easy pushing this through the Likud. Jameel, I still have more faith in Bibi and don't think he will be endorsing such a plan anytime soon. Nevertheless, if he does, unfortunately history shows us that the difficulty of pushing something through the Likud will not deter a Likud PM from pursuing his own agenda regardless (I'm referring, of course, to summer 2005). I am sure Bibi understands the dangers this plan holds. I voted for NU since I think Bibi is too moderate on certain things but he wouldn't go this far. I have not seen any evidence for this - have you? Why is ti so important that Isralis NOT live in the proposd palestininas state. Many arabs live in Israel. If the Arabs really accept Jews and just want their natural soveriegn rights - couldn't they not agree to accept the Jewish minority in their midst like Israel does to arabs. SOunds like an echo of Lieberman. He ain't giving in so fast. But in any case fasten your seat belts we are in for a wild ride. Hashem Yishmerenu from all who seek their own destruction. WTF do we need to have sovereignty over east jerusalem. We still have Jerusalem as our capital - then again, it wont do any harm to have our capital in Tel Aviv, thats where the real business happens. The old city is holy to all - why not have it as an international city with free movement for all. Israel can and should reject an ultimatum to commit national suicide. If Israel is commanded to give up Jerusalem, then it is better to stand fast and die than to capitulate and be left without the country's heart. This should be a "red line" for the Jewish people. In a short word: "NEVER!" If I thought it would actually bring peace, I would be willing to give up everything Obama is asking for. But I don't see Israel living in peace after this. She'd be giving away the farm and receiving nothing in return. The old city is holy to all - why not have it as an international city with free movement for all.Because only under Israel has there has been free movement. "he old city is holy to all - why not have it as an international city with free movement for all. "Holy to who? Judaism, Christianity, and Islam. Assuming this, let's go back a few years: Christianity claims the importance of Jerusalem either because it claims superiority over Judaism (which should not be accepted) or because of Jesus, who lived about 1,800 years after the events that begin Jerusalem's importance to Judaism (starteing with Aqedat Yitzchak). Islam would be about 2,400 years after Judaism's date of importance. If someone woke up today and claimed Washington, D.C. was a holy city to them, and kept saying this for the next 1,000 years - does that mean they have right to the city? No. rights to a place do not change just because someone claims it's theirs too - with no rights to it. Tony: Why do you think their currently isn't free movement in the Old City? There is...and all people are welcomed. There has never been a situation except under Israeli rule, where freedom of religion has been guaranteed. What's the point of "West Jerusalem" without the Old City? The epicenter of Jerusalem is the Old City, as proud Zionists say in Hatkva, "To be a free nation, in our land, in the land of Zion -- Jerusalem"
Tel Aviv should be our capital? You sould like a proud Post-Zionist to me. It's nothing to be ashamed of, but calling yourself a "proud Zionist" who wants to abdicate Israeli Soverignty over Jerusalem is simply a distortion of terms. To sign your message with "Am Yisrael Chai" while willing to run away from our homeland is not what kept the dream alive for our people for 2 thousand years. Obama is bad. Bad for the Americans Bad for the Jews. Even Canada is avoiding him. As an American, I think it is absurd for Obama to think Jerusalem should be divided. It is NONE of our business. That said it is my opinion (as a Christian) that scripture clearly shows all of Israel belongs to the Jewish people, particularly Jerusalem. As for it being holy to all? Whatever! Muslims place it as the 3rd holiest(?) probably just to keep their foot in the door. Christians? Well I admit I would love to visit the place where Jesus walked and it is relevant to me also because of the old testament but as a non-Israeli, it is NONE of my business. My opinion only: Israel should NEVER surrender one inch of the land given to them by God...not to any people. Oh, yeah! Just who is going to implement this plan? The US Army, Navy, Marines, and Air Force? Who does he think he is, to order a sovereign nation to REMOVE their sovereignty. They have enough trouble back home, with some of the so-called United States claiming their own sovereignty, not quite the "united", and not adhering to Chairman O's edicts! Who does this character think he is? Oh, yes, we now know: Akiva and Yehezkiel 38 have named him "Gog" of Magog. This is irresponsible rumor mongering designed to stir up frum Jews and Jameel had no business posting it. The source for this story is not someone who works for the President or the state department but the Palestenians themselves. Im appaled and disgusted the Jameel put this baseless garbage on his blog and embaressed that the predictable Barak Bashers jumped on board without any self reflection. Im also disgusted to see so many of you acting like weak ghetto Jews. Obama is the president of America, not Israel. He has neither the power not the authority to "make" Israel do anything. Finally, lev melachim byad hashem. The same God who restored you to Israel controls the hearts of kings, Barak Obama included. If you fear his policies examine your own merits and beg God for merecy. Don't whine on a blog. And for God sake stop believing every fool stupid anti Obama thing that fits your preconceived notions and phobias. Are you playing a trick on your readers? The Jpost link in your post goes to an article dated 5/21 in which Benny Ayalon says Obamas policy is essentially the same as the Bush policy and also denies that any Obama plan has been finalized. In other word it undermines all the claims you make completely. And I hope your moron readers feel better. Hey Anonymous, what bubble do you live in? Did you wake up this morning and not read how Clinton is demanding that even "natural growth" be ended? Have you not listened to Israel radio where it was discussed? Do you not know how to read the Jerusalem post where it says the article was published on 5/20 and then updated on 5/21? This is irresponsible rumor mongering designed to stir up frum Jews and Jameel had no business posting it. The source for this story is not someone who works for the President or the state department but the Palestenians themselves.Well, this is the way it was reported on Galei Tzahal / IDF radio yesterday morning at 9 AM. Im appaled and disgusted the Jameel put this baseless garbage on his blog and embaressed that the predictable Barak Bashers jumped on board without any self reflection. I quoted the source directly. Why not blame Galei Tzahal? Does shooting the messenger make you feel better? settlement policy? The US didn't cause Israel to stop the Lavi project? The US isn't pressuring Israel over settlement policy today? Howabout Hillary Clinton saying "Israel must stop all settlement activity, even natural growth"? Obama plan to include Jerusalem Old City international zoneMedia reports: The new plan is basically an upgrade of the Saudi peace initiative. Sound sounds like a comment from another Obamaniac. "B Hussein O" WORKS FOR THE SAUDIS. Jews all over the world should wear a button that says "NO TO THE SAUDI PLAN"
What I heard on the radio here in the US from the woman covering the white house for our station (who has been covering the WH for 30 years and sounds very bi-partisan) is that the "Peace Process" is going to be a very long one because both Israel and the US will be insisting that the first step is official recognition of the State of Israel by the Palestinians (and optionally but preferably also by the surrounding Arab countries) and without that, there will be no further negotiations. I'm hoping she knows what she's talking about! The previous post was perhaps, too snarky. Hillary Clinton -- Get out of my bedroom! Religious Jews are the World's Strictest Parents? Who's Paving the Way on J-Street? You Decide, We'll blog it. Reason #217 for hating Albuquerque. Arabs, in their own words.